Buy Bio D fragrance free sanitising hand wash 5000ml in the UK from our online shop or directly from our independent Scottish store. Fast acting anti-bacterial fragrance free hand wash. Kills 99.9% of harmful bacteria whilst being gentle on your skin. As official Bio D stockist, we sell genuine Liquid Hand Wash directly from our shop in Scotland and online throughout the UK. Where can you buy real Bio D Fragrance Free Hand Wash 5 l safely online? If you are wondering where you can buy Bio D fragrance free sanitising hand wash 5000ml safely online in the UK, then shop with us. We are an actual health foods shop; with real people selling real foods and products. Our award-winning independent shop is located in Stirling, Scotland since 1976. You can buy our Hypoallergenic, vegan and environmentally friendly cleaning products and other genuine Liquid Hand Wash in store or safely place an order with us online or over the phone. 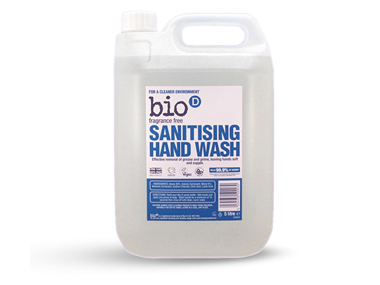 Bio D Fragrance Free Hand Wash 5 l - Bio D fragrance free sanitising hand wash 5000ml in Liquid Hand Wash and Hand Soaps.